New research by WARC has found out that the Indian ad market is forecast to expand by 13.0% this year and a further 12.4% in 2017. Programmatic advertising is serving the industry to double in size and helped to connect millions of agencies and advertisers to publishers and media houses around the globe. 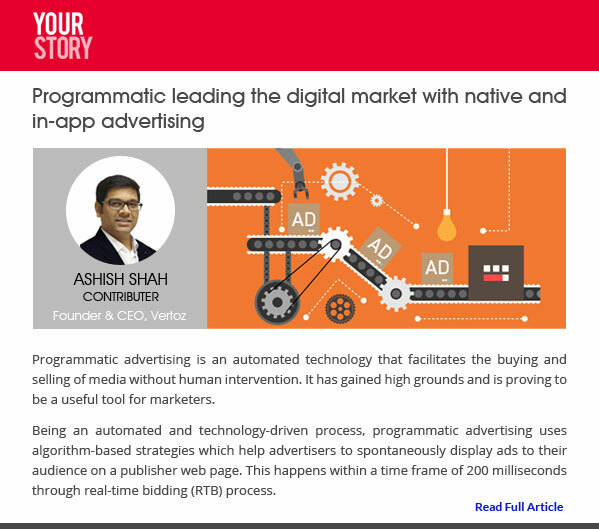 In this article, he explained how programmatic is blooming in India and accruing demand from SMEs to large businesses and organizations. As India is being called a mobile-first country with e-commerce and digital companies moving to the app only experiences. As marketers are spending an increasing percentage of their ad budget on in-app and native advertising, both has been on a rise in the Indian ad market. YourStory.com is India’s number one media platform for entrepreneurs, dedicated to ardently championing and encouraging the entrepreneurial network in India. It was started in October 2008 by Shradha Sharma. Since its inception, it has outlined stories of over 15,000 entrepreneurs and has delivered business networking opportunities to over 50,000 entrepreneurs via their conferences and meetups. It comprises of 5 million niche readers from India and across the world. Programmatic advertising comprises of automated media buying, placement, and optimization of digital advertising, where both supply and demand partners are free from human intervention. Vertoz is among the top programmatic company that offers engaging and innovative advertising and monetizing solutions.